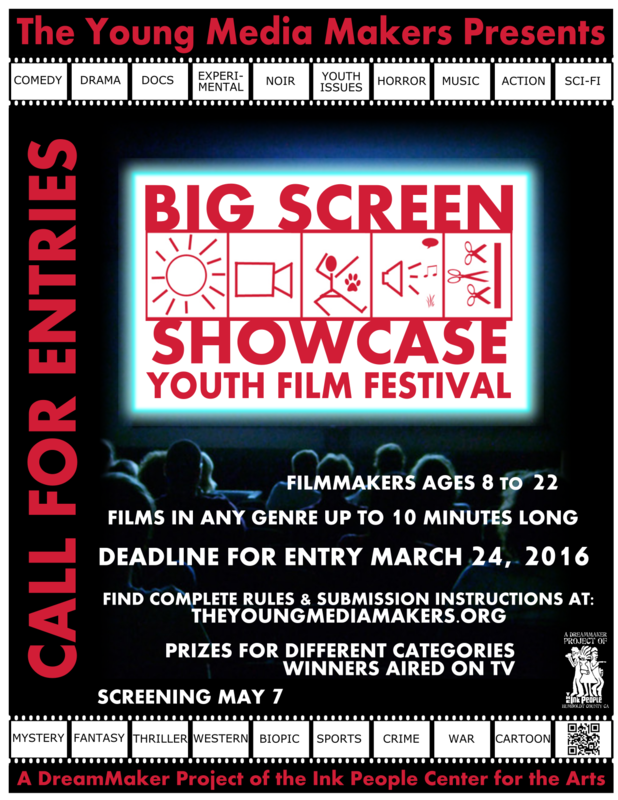 The Young MediaMakers 16th Big Screen Showcase announces CALL FOR ENTRY ! The call for entries is open for all young, aspiring and active filmmakers. If you are ages eight to 22, enter your movie in The Young MediaMakers 16th Big Screen Showcase. Finish up your movie now and enter your masterpiece of picture and sound by the deadline APRIL 6, 2016. Your movie will have a chance to light up the big screen, win prizes, and get some television airtime. announcement, narrative (comedy, drama, social issue), documentary or experimental. This is an international festival and call for entry is open online. 2. Fill out release form completely. Send via email to bad@humboldt1. com or send with physical media to address below. 3. Your release form, entry form and movie must be received by the deadline, April 6, 2016. Just go to www.TheYoungMediaMakers.org select “enter your film,” completely fill out the form and press “send.” Fill in Release Form send with media or in mail. The local screening will be Saturday, May 7 in Eureka.